It’s another lazy Sunday. It’s my day off…ha…ha…ha…! Every day is my day off. But, on Sunday, my only task is to peruse (did I spell that right?) the paper, have a cup of tea, and ruminate over what to make for dinner in about eight hours. That’s pretty lazy! It’s a good thing. My iPad rests on my knee while I check my emails and watch the dogs sprawled out for their morning nap. It’s their day off too. My husband is watching one of his hunting shows on TV, where goofy men dressed in camo, toting guns, are slurring something in an indiscernible Southern accent. It doesn’t get better than this! Sunday is a day for reflection. Whether sitting alone, at your local place of worship, or lounging in your jammies on your sofa, (that would be me), it’s a great time to reflect on the past week and make plans for the days ahead. All in all, I had a good week and a great start to a new year. I’m writing more, reading more, and contemplating my next painting project. Yesterday, I was inspired by my dear friends, Mandy, Julia and Liz, at our Saturday morning writing group. They loved my new blog and encouraged be to “keep up the good work.” They also mentioned that I should share other blogs that I enjoy with my friends. So, if you like to write, I love Patricia Burroughs. She is an excellent teacher, awesome author, and entertaining blogger. I took a writing class with her a few years back and really learned so much. Check her out. Also, I’d like to share a cute photo that I took yesterday at Snug on the Square in downtown McKinney. It’s my favorite little coffee/sandwich shop. 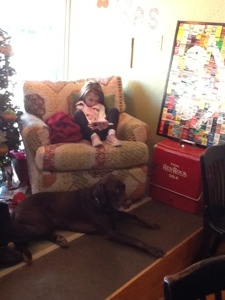 There was an adorable little girl sitting in an overstuffed comfy chair, with her faithful companion at her feet. Just too cute to pass up.